L.A.’s Favorite Chili is now available for delivery to you! 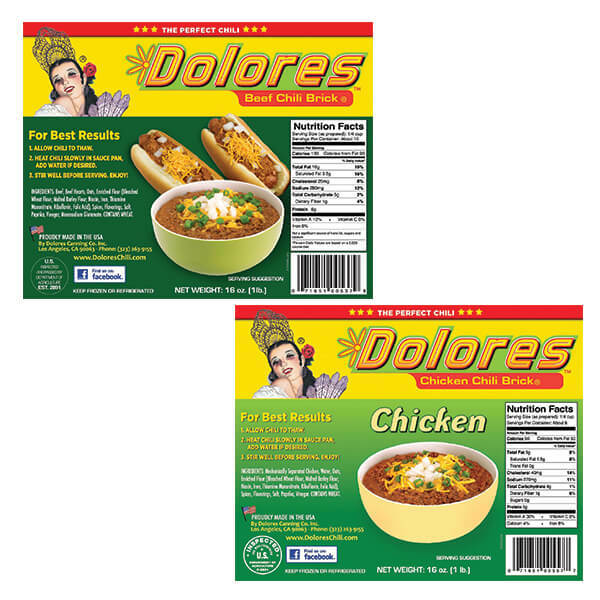 Our World Famous Dolores Chili Brick is shipped to you in a convenient 6-pack freezer box. This package contains 3 Original Beef Chili Bricks and 3 Chicken Chili Bricks in 16 ounce retail trays along with ice packs to keep it cold. Add water or beans to our Chili Brick or use it as a base for Your Chili Recipe. Each package will make enough Chili for about 4 people! So this is a great value. We’re excited to finally have our Chili Brick for sale online, order yours today! Our product is shipped via UPS flat-rate 2nd day air. Our product is shipped frozen and needs to be refrigerated upon arrival. Dolores Chili orders will only be shipped on a Monday, Tuesday or Wednesday so they can be delivered before the end of the week. All orders placed on Thursday, Friday or over the weekend will be shipped the following Monday.